Clarkesworld is a monthly science fiction and fantasy magazine first published in October 2006. Each issue contains interviews, thought-provoking articles, two reprints, and at least four or five works of original fiction. Our fiction is also available in ebook editions/subscriptions, audio podcasts, print issues, and in our annual print/ebook anthologies. Clarkesworld has been recognized with a World Fantasy Award, three Hugo Awards, and a British Fantasy Award. Our fiction has been nominated for or won the Hugo, Nebula, World Fantasy, BSFA, Sturgeon, Locus, Shirley Jackson, Ditmar, Aurora, Aurealis, WSFA Small Press and Stoker Awards. 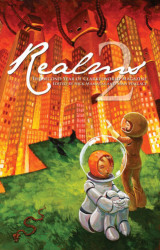 All of the original fiction appearing in Clarkesworld Magazine is collected in our annual anthology series and published by Wyrm Publishing in trade paperback and ebook editions. The first nine volumes are currently available. Within one month of online publication, each issue will be published by Wyrm Publishing in print format and sold at conventions and via Amazon. You can find them here. For wholesale terms, please contact us at wyrmpublishing@gmail.com. Details on subscribing to electronic editions of Clarkesworld can be found here.